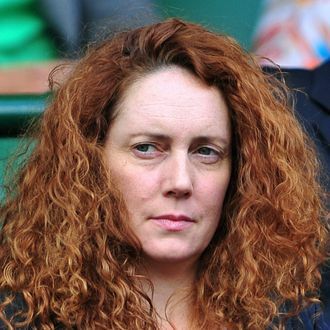 British prime minister David Cameron texted onetime Rupert Murdoch deputy Rebekah Brooks to “keep her head up” the week she resigned from News Corp. over phone-hacking, the Times of London reports via a forthcoming book, just a few days before Brooks appears again before parliament. * Cameron also apologized to her for his “sudden coldness,” but said he was “on the run” because of the sweeping scandal. Brooks’ coziness with Cameron is well-known (see: horsegate), but the specifics may prove embarrassing and are guaranteed to come up as she faces the ethics inquiry on Friday, as larger concerns about the Murdoch media company’s political connections loom amid allegations of not only hacking, but also bribery. But, as always, the bottom line matters most, and it’s hardly been affected at all, save the millions spent on settling lawsuits — estimates put profits up 19 percent from last year for the period ending in March, the Guardian reports. “The share price is really separating from what is happening in the UK,” Alaweed said. “We see the price is hovering around $20 and the results are very good.” Everything else is just an annoyance. *This post previously referred to Cameron as the former prime minister. He is, of course, still in office.